First of all, obviously, the critter is already dead. If you're a hunter who hunts or fishes for the meat, the animal gave its life for a good cause, you're making sure it doesn't starve to death over the winter, and there's certainly nothing wrong with preserving its carcass. Our second point (and this is particularly important if 90% of your non-hunting hours are spent in front of the TV), it proves you've done something you can be proud of. Even when the batteries fall out of the remote and you have to stare at a blank screen, all four of your kids (even the illegitimate one) is in jail and not one good monster truck rally has gone through town in over ten months, you can look up at that big moose head and remember that one day, a while back, you done good. Next; you're supporting a traditional American craft. In our high-tech day and age, when many people work with computers and satellites and any number of things that weren't even invented a 100 years ago, taxidermists are practicing an art form that was around when our great nation was first born. Really, it's almost un-American not to support a taxidermist's skill. Take this sage advice and you're sure to enjoy those lasting taxidermy trophies mounted up on the wall in no time! 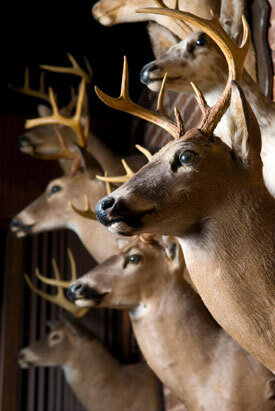 Let your local taxidermist make a trophy you'll be proud of.